In a space that most recently was Cotton and Corn, at the office, we’ve been watching the anticipated opening of Uncle Jack’s Meat House. We eat next door (technically next door to next door), at Vinny’s, frequently and we heard, all summer, that they were opening in a couple of weeks. 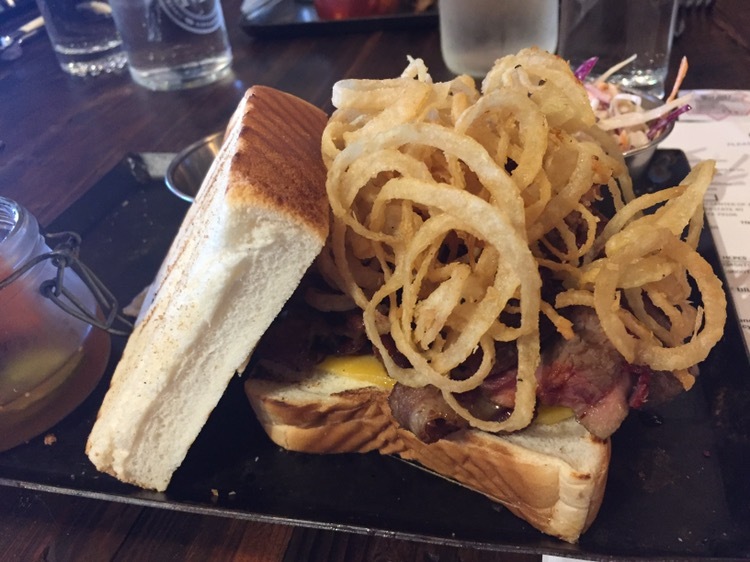 This is the first metro Atlanta restaurant from Willie Degel (host of Restaurant Stakeout on the Food network and owner of Uncle Jack’s Steakhouse, and a couple of other Uncle Jack’s places). 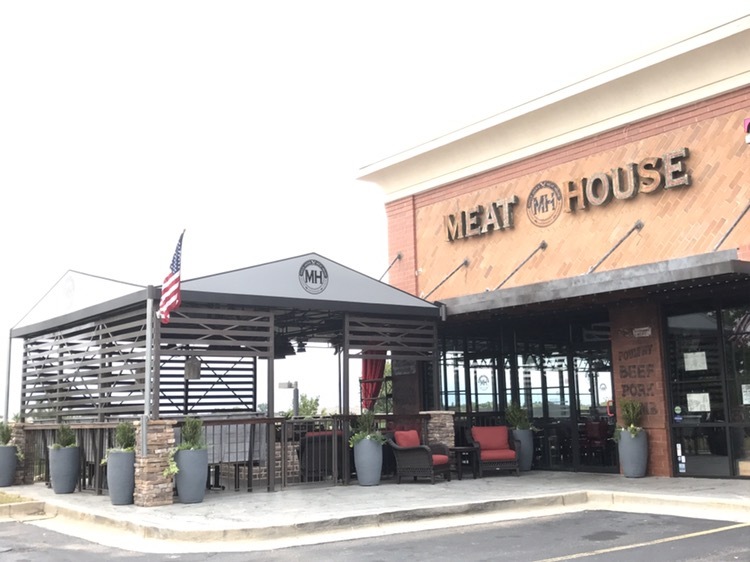 The Meat House is a new chain of his, with this location in Atlanta and one coming in Astoria, NY. They finally did open, around the first of September, and I paid a couple of visits during the first six weeks. There is only one menu, which they use for both lunch and dinner and, to quote my dad, they are “mighty proud” of their food. The menu is (apparently to be) shared with the Queens location, so that may explain the New York prices. Based on the prices, I planned those visits when someone was taking me lunch – on each occasion, the bill has averaged more than $20 per person, for lunch food. 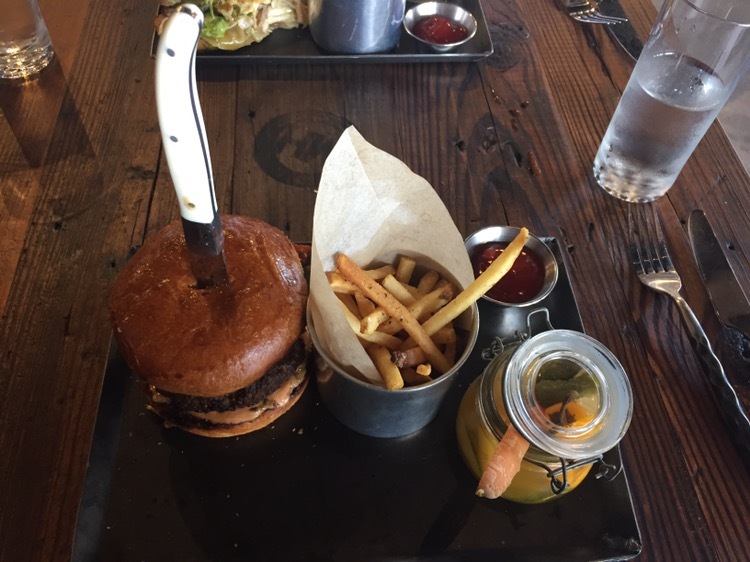 On my first visit, I ordered the Ooey Gooey Mooey burger. I’m guessing that it is about a half pound of beef, with secret sauce (think thousand island dressing), onion jam, maple pepper bacon and a buttermilk bleu cheese fondue. I skipped the onions and the bleu cheese. This was a tasty burger, served with crispy house cut fries and (oddly) a crock of pickled vegetables. I passed the pickles across the table to my host, who was having the brick-pressed chicken panini. On my second visit, I had the brisket sandwich, with crispy onion rings, slaw and (again) the crock of pickled vegetables. A really good sandwich. Both times the restaurant has been about a quarter full – I’ll be watching over the coming months to see if the lunch crowd increases in volume. And wondering how they are doing with dinner service. Update – one year later. They are still open – I’ve been back a few times since. The menu has gone through a couple of iterations – and the prices have come down a bit. For example, the Ooey Gooey Mooey burger is now $14.00, and they’ve added in daily specials. Recently, I stopped in for the Tuesday fried chicken special. The crowd was low, as it seems to be on most of the visits that I’ve made, but they must be doing a decent night time and weekend business. It was, basically, half a chicken with a biscuit and a small side of gravy (at $18.00). It was served piping hot and the chicken was above average. I don’t know that I’d go back, specifically, for the chicken, but it looks like they’re going to make it and I’ll still have a place for a business lunch.